There's a pretty good deal right now for Acer's flagship gaming monitor, the Predator XZ321Q. 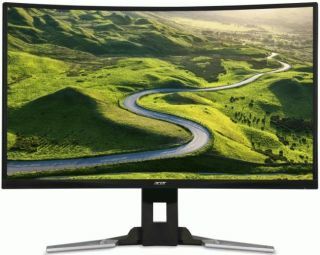 Ebuyer currently has the 31.5-inch curved display marked down to £280 (inc. vat) versus its normal selling price of £410. The panel type on the Predator XZ321Q is VA. It has a 1920x1080 resolution, 144Hz refresh rate, 4ms response time, 300 nits brightness, and 100,000,000:1 contrast ratio (dynamic). It's also equipped with AMD's FreeSync technology for variable refresh rates, but you'll need an AMD graphics card to take advantage. There are a couple of 7W built-in speakers with DTS Sound and Acer TrueHarmony technology, though we've yet to be really impressed with the audio on any monitor. Connectivity options include HDMI, DisplayPort, and mini DisplayPort. There's also a built-in USB 3.0 hub. On the ergonomics side, the Predator XZ321Q supports tilt (-5 to +25 degrees), swivel (+/- 30 degrees), and up to 120mm of height adjustment. Go here to grab the monitor.